← ADOT IS RACIST! O’odham Resistance Against the Loop 202! It’s time to turn up the heat! FHWA In Favor of Building Freeway! On March 5th, 2015, the Federal Highways Administration (FHWA) released their Record of Decision (ROD) in favor of building the South Mountain Freeway. The ROD is a document that gives the Arizona Department of Transportation (ADOT) the approval to begin acquiring right of ways and to begin construction of the 22-mile-long freeway that blasts through three ridges of Moadak Do’ag (South Mountain). Moadak Do’ag is sacred to all O’otham tribes and holds cultural significance to eighteen other tribes. This project has been opposed by members of the Gila River Indian Community since the 1980s. There are numerous harmful impacts of freeway construction which include destroying the prehistoric villages of Villa Buena and Pueblo del Alamo, the destruction of threatened/endangered animal habitats, and the destruction of plants that are central to traditional O’otham culture. Environmental impact studies of the 202 freeway also state that the habitat for wild horses in Gila River would be irreversibly lost if the freeway is built, and that no alternative habitats for the wild horses exist. One of the Gila River Indian Community’s entertainment destinations is named after the wild horses that the freeway would destroy if it is built. The path of the approved design also would destroy many groundwater wells, with no replacement wells planned for by ADOT. It is for these reasons and many more that in 2012, the Sierra Club named the South Mountain freeway one of the worst transportation projects in the United States. ADOT states that the project will cost taxpayers $1.9 billion to complete, and that it would take four years to finish if construction begins in 2015, with an opening date in 2019 or 2020. The project is partially funded by tax revenues from a Maricopa County transportation tax, and those tax revenues have declined following a nationwide trend of less vehicle miles being driven. Because the state does not have the finances to start or complete the freeway, ADOT was forced to use a P3, or Public – Private Partnership to plan the freeway. A P3 is a business deal between the public sector and corporations who take on responsibility to design, build, maintain, and/or finance a project, so that completing the project is more attainable. The corporations benefit from receiving federal contracts, tax breaks, low interest loans, and state tax revenues in later years. By using a P3, ADOT hopes to build the freeway without having enough money to do so on its own. The FHWA’s decision to green light the project is a middle finger to tribal sovereignty, Indigenous religious freedom, and civil rights. There are three tribal resolutions in the Gila River Indian Community’s with wording about the Community’s duty to protect and preserve their sacred lands. Gila River voters also had a February 2012 vote in which the Community voted in favor of the No Build option for the 202. However, GRIC is never mentioned as a stakeholder in FHWA’s Record of Decision, although 202 impact studies clearly state that members of the Gila River Indian Community (GRIC), the first people of the land, will no longer have access to a particular area of the mountain range that has been held sacred for thousands of years. GRIC released a response to the ROD, stating their disappointment in ADOT and FHWA by not choosing the No Action Alternative to avoid irreversible effects to traditional cultural property. GRIC’s first press release incorrectly referred to the ROD as the “Record of Discussion”, not as the “Record of Decision”. This was quickly corrected, but it showed that tribal leadership is not familiar with basic terms regarding this phase of ADOT’s freeway planning. The GRIC statement stated that the Community will be further evaluating the ROD in the coming weeks to evaluate the appropriate action. Many GRIC members are hopeful that the tribe will formally litigate against ADOT and FHWA, citing the tribal resolutions to protect traditional cultural properties. Leadership from Komadk, the area of GRIC most affected by the freeway design, are expected to be especially vocal in the fight against the freeway, as Komadk has a tribal council seat up for grabs in June. It appears that ADOT may already be clearing lands along the freeway route. 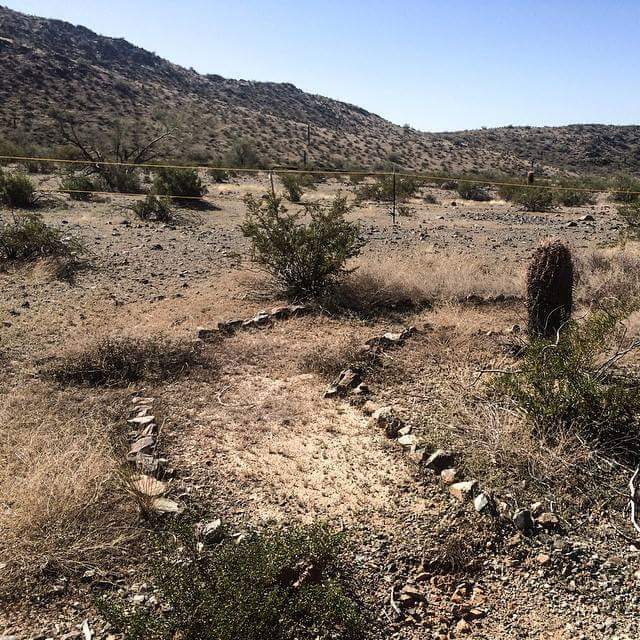 Waylon Pahona, a former Gila River Health Care employee who created a Moadak Do’ag running trail with others, recently returned to the trail to find that it is almost gone. The trail has been barricaded and cleared of cacti, and Pahona states, “I will never forget the memories we created by having people run the trails to be healthy. I will never forget my past and I will never forget that you are greedy people.” GRIC members are also reporting that cacti and medicinal plants are already being cleared out with heavy equipment. It is not known who is grading the land, installing barricades, and removing cacti of up to 3000 pounds, but it is not any GRIC department. This battle will be fought on all fronts. FHWA may have approved ADOT’s freeway design, but the release of that decision means that ADOT and FHWA are now vulnerable to lawsuits. 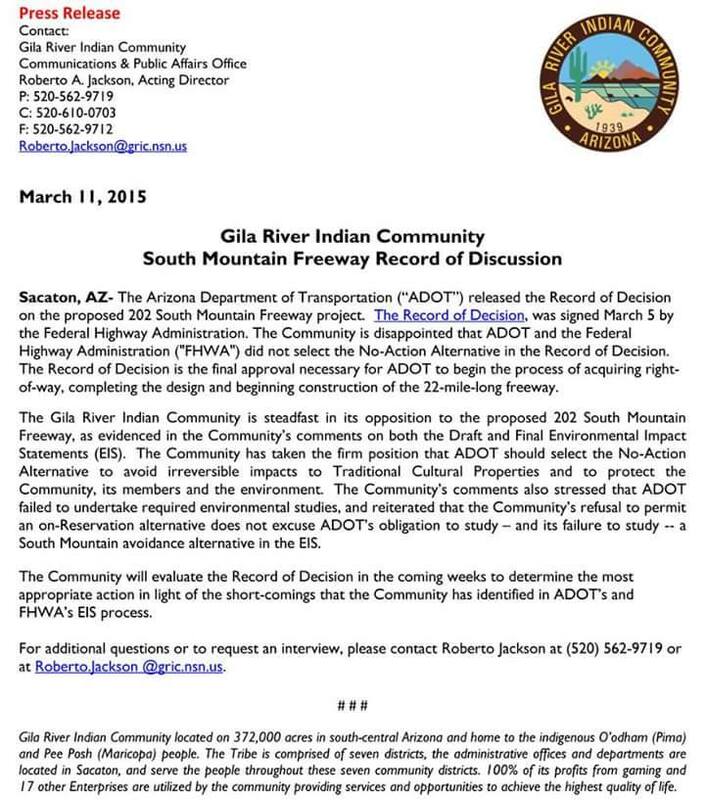 There will be litigation against ADOT and FHWA, hopefully coming from the tribes impacted by the freeway design. With tribal elections in June, GRIC members should expect all candidates to publicly state their stance on the 202, as well as any plans to stop construction from beginning. This issue has been in our Community for over thirty years, and for too long, many of us have been silent about it, or have not gotten informed about the harmful impacts to our families. With litigation against ADOT, GRIC tribal Council upholding resolutions, and the people united to protect the land, this freeway will never be built. Not one bulldozer tearing up our Creator’s home. If you haven’t actively helped 202 resistance, now is the time. We need people to flyer and table at Community events. We need to influence tribal elections so that ineffective leadership, the leadership that has allowed ADOT to get this far, is voted out. We need prayer runs to help us heal and to honor the land. We need children and elders to share their stories about the wild horses and the land ADOT wants to destroy. We need families to discuss the freeway in their homes. We need to post those tribal resolutions to inspire others to take action. Lawsuits will come, but there still needs to be a presence outside of them, from the people. For additional project information, or to view the Record of Decision, visit azdot.gov/SouthMountainFreeway , call 602.712.7006 or email projects@azdot.gov. This entry was posted in Uncategorized and tagged Akimel O'odham, AOYC, GRAL 202, no build, No Loop 202, No South Mountain Freeway, Sacred Sites. Bookmark the permalink. 3 Responses to It’s time to turn up the heat! FHWA In Favor of Building Freeway! Pingback: AKIMEL O’ODHAM – ARIZONA: IL EST TEMPS DE FAIRE MONTER LA PRESSION! L’ADMINISTRATION U.S. DES AUTOROUTES EN FAVEUR DE L’AUTOROUTE 202 ! Anti-Freeway Protestors Crash Loop 202 Networking Event! ADOT IS RACIST! O’odham Resistance Against the Loop 202!